If you’ve just discovered that you have a bed bug infestation, you’re probably starting to feel pretty stressed out. You want this problem to go away as quickly as possible, but you don’t know where to start? Do you call a professional? Buy chemicals over the counter? How do you get started without wasting any time or money? When you receive the kit, you might be taken aback by the variety of items inside: the kit includes a bottled spray, a canned spray, a bottled powder, and a unique powder applicator. It’s important that you follow the product label for each, to ensure that you use the products safely and effectively. The Express Kit ships with two sprays, Cymex and Temprid Ready-to-Spray. The Express treatment starts with Cymex, a natural liquid spray. Cymex is your contact killer, meant to cut the bed bug population down quickly and evaporate shortly after, leaving no residue. You can spray Cymex on carpets, furniture, drapes, and cracks and crevices throughout the room. This is the only item in the kit that you can use on open surfaces, like the top of your mattress or furniture cushions. Just don’t use Cymex on wood or tile floors, as it could cause a slippery surface. Allow everything to dry before touching or reusing them. Since Cymex works best on contact only, you’ll need a residual spray for long-term killing. The Express Kit includes one of the best new residuals on the market, Temprid Ready-to-Spray. 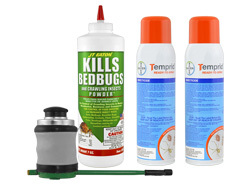 Temprid Ready-to-Spray uses a dual-action formula for fast-acting control that lasts up to 6 months. Apply Ready Spray to the seams and folds of mattresses and box springs, as well as the joints of your bed frame and headboard. Then, move onto cracks and crevices in baseboards, moldings, under floor coverings and carpets, inside closets and shelves, and behind curtains and picture frames. You’ll want to reapply Temprid again in about two weeks, and again two weeks after that, for a total of three treatments. For places that can’t be sprayed, JT Eaton’s powder and applicator work wonders. There are some places you can’t use sprays, like around light switches and electrical outlets. This is where a residual powder, like the included JT Eaton Kills Bed Bugs Powder, comes in. This is a diatomaceous earth powder that can be applied where sprays can’t. Once diatomaceous earth is in place, it will kill indefinitely as long as it stays dry. Use the included professional powder applicator to lightly puff some powder into wall voids, along your baseboards where the wall meets the floor, and behind the cover plates of electrical outlets and light switches. Make sure to wear gloves and eye protection, and to only puff a little bit into each place – if you see dust coming out of the void, there’s enough powder in there. Use the Express Kit as part of our proven 4-step solution. The Express Kit is meant to be used in conjunction with the other steps in Bed Bug Supply’s comprehensive 4-step solution. Our 4-step solution has been proven over the years to be the best do-it-yourself method out there. As always, make sure to follow the product labels and MSDS for safe and effective usage. Our Express Bed Bug Kit is the only kit on the market that includes FREE 2-Day Express Shipping, letting you start your offensive as soon as possible.